Working with Rikki Starr Entertainment is a pleasure. They are wonderful and very professional. Lots of fun. That's why we recommend them. Absolutely Great! Use Rikki Starr Entertainment, they offer your kind of music. Since you were a small girl you wished upon a star for a perfect wedding day. 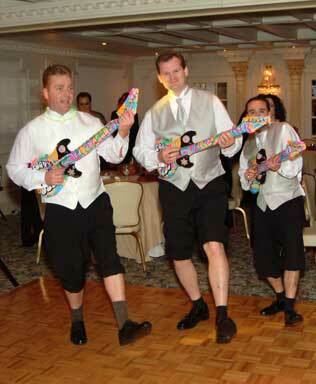 There is no need to wish, you will have it with Rikki Starr Entertainment at your reception. Working with Rikki Starr Entertainment is always a great experience. The party is never dull! They are true professionals! I've been a wedding photographer for 20 years. I've seen Rikki Starr and his entertainers several times and I knew they were for me. My wedding didn't miss a beat. Rikki Starr Entertainment is a personable, reliable, and energetic company. Your party will always be a success! We want to thank you for the great time we had at our wedding at the Cotillion in Garfield, NJ. Everyone is still talking about the Mummy Wrap Dance! We would like to thank you for the amazing job on both the music and the video. You helped create some amazing memories. We look forward to seeing you in the future as many of our friends have reserved you for their weddings. It was a pleasure. We just wanted to let you know you were the greatest DJ we could have ever had for our wedding. You made everyone get out there and have fun. We will be telling all of our friends about you. Ann Marie and Tom D.
Both ourselves and our wedding guests had a great time. This credit is owed to Rikki Starr Entertainment. They were marvelous.